‘Tis the season to be jolly, but there is not much to be jolly about when you are struggling to find the perfect gift for the man who has it all. A recent survey was conducted on the top Christmas gifts for men. Over 16,000 affluent men were asked to list what they would most like to find hung from their stocking with care, and the results might surprise you. Gift Ideas for Men can be difficult, but we are here to help. In a digital world where too many with bare wrists check the time on their cell phones, it might seem like the Golden Era for men like Dwight D. Eisenhower and Paul Newman has passed. But among movers-and-shakers, the fact still remains that nothing says status quite like a Rolex watch. An overwhelming 82% of those surveyed chose the Swiss timepiece as their preference, followed by smart phones, sporting event tickets, jewelry, and clothes. There is something eminently timeless about Rolex watches. From the unmistakable logo atop the bejeweled face, to the way the second hand gracefully sweeps and never ticks, no matter the model, the immaculately crafted Rolex is more than a watch; it is a work of art. The Rolex Oyster Perpetual Submariner was chosen above all other models, as 32% of those surveyed picked the watch originally designed for diving and known for its maximum submersible depth of 300 meters. Featured prominently in eleven James Bond movies, the movement of the Submariner is now wound by even the slightest movement of the wrist, and the generated energy stored in the mainspring allows the watch to function with no movement for up to three days. Here is the compiled list of those who favor a certain line of watches. The Rolex President – El Presidente – is the Holy Grail of Rolex watches. Brand fanatics will tell you that the Rolex President is the Day-Date model customized with a specific bracelet, known as The President, and is available only in solid 18-karat rose gold, yellow gold, white gold, or platinum. Famously worn by President Eisenhower, the watch was the first to display the day and date in its entirety. 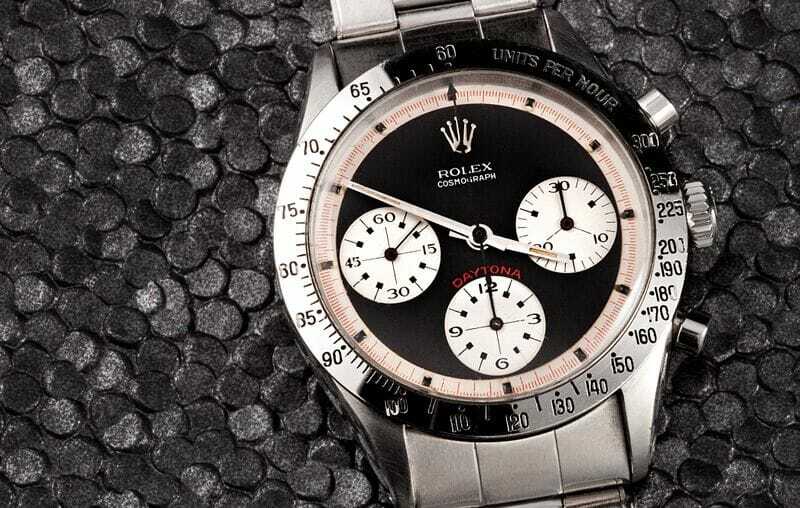 The Rolex Cosmograph Daytona is the archetype of a sport watch for racing drivers. Screen legend Paul Newman received the watch from his wife, Joanne Woodward, in 1972, and he wore it until his death in 2008. The Rolex Oyster Perpetual Date-Just has the honor of being the first wristwatch with a date function. The watch, which served as the basis for the Submariner, was wrapped around the wrist of Chuck Yeager when he broke the sound barrier. The Daytona Paul Newman 6239 is a great Holiday Gift. The Rolex Oyster Perpetual Date GMT Master was first designed in 1954 in collaboration with Pan Am Airways in order to be used by its pilots and navigators. The watch, which allows the wearer to easily see two time zones at once, was a necessity for pilots who needed an accurate GMT source – which was required for all aviation planning, weather forecasts, and schedules – before the days of GPS. Nowadays, the watch is just as popular with businessmen and travelers, NASA and military pilots, and soldiers and sailors. A helpful hint: If the price tag on the Rolex is out of your range, a certified pre-owned watch will make the purchase much more palatable. Smart Phones – How Did the iPhone Do? In the ongoing debate between the Apple iPhone and all others, the iPhone wins hands-down. Of the 12% of respondents who are looking for a smart phone this holiday season, the iPhone was decisively favored over the runner-up – the Samsung Galaxy S III – by a nearly three-to-one margin. Despite the iPhone 5 being nudged by the Android phone in screen size, photo clarity, battery life, and most other measurable means of comparison, the cache of the Apple brand, the ease-of-use, and the wide availability of apps simply make it no contest. Although smartphones are desirable as a holiday gift a Rolex Watch trumps them all. Football Tickets – on Top? On the more affordable end of the spectrum, tickets to sporting events are a popular, memorable choice. Among those surveyed, NFL football was the runaway favorite at 52%, followed in order by baseball, soccer, basketball, and NASCAR. The ever-growing popularity of football has eclipsed America’s pastime for a variety of reasons. The pastoral beauty of the baseball diamond, the allure of peanuts and Cracker Jacks, and the tranquil pace of the game will always make the ballpark a top destination, but the football stadium is our modern-day Greek Coliseum. Nothing compares to the smash-mouth spectacle of the gladiators on the gridiron dueling it out in the trenches, allowing men who might feel confined by the staid, workaday world of collars, ties, and coffee a moment of escapism, a constructive way to let out their built-up carnal rage in all its painted-chest, beer-soaked glory. Whether it is a result of the stratospheric rise in popularity of fantasy football, the ubiquity of the wall of televisions at any bar or restaurant, the week long run-up making each game feel like an event, the advent of DVRs and the availability of every game via satellite dish, the added incentive of the spread and the over/under, or a combination of all of the above, no other conclusion can be drawn but football is here to stay. In fact, nine of the ten highest-rated television broadcasts in 2011 were NFL games. No matter the game, no matter the teams, you never know what you can expect to see at a live football game – or even at the pregame tailgate party – making each ticket a sought-after gift not only for the access granted into the stadium but as frame-worthy evidence of a good time had. Football tickets are also at the top of the the wishlist. The perennial choice, clothes, may be a practical gift idea, but evidently not exciting enough, which should come as little surprise to anyone who ever grew up un-wrapping a pair of socks on Christmas morning. If you use this information as your guide during your shopping this month, when the man in your life who thought he had it all opens his gift from you on December 25th, he will find himself pleasantly mistaken. No matter your choice, you will have given him a keepsake to remember you by – and a reminder that all of his years of toil and sacrifice have come to fruition.